The Cebuano biko is a sticky rice cake made from sweetened coconut milk, sugar and bits of ginger topped with caramelized coconut cream. “Latik” is the local term for the curdled coconut cream. 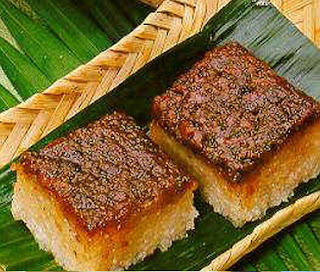 The caramelized latik gives the brown color for the biko and is either served on a plate or wrapped in banana leaves. Some Cebuano versions of the biko have calamansi rind in it. The cool and soothing effect of the ginger in the biko neutralizes its sweet taste. Since the biko is very sticky, I have to eat it slowly so I can savor every bite of its delicious taste.